The wind picked up throughout the night which I hoped would blow away the clouds and freezing mist. Instead, looking out the tent door in the morning, I found everything - skis, poles, tent guy lines, shovel ensconced in nearly an inch of iced rime. I had weird dreams during the night but couldn't quite remember what they were. I was up and out of the tent fairly efficiently then packed up camp and was skiing. For about 15 minutes, I could see the outline of a few drifts. The wind picked up even more and then the light went completely flat. 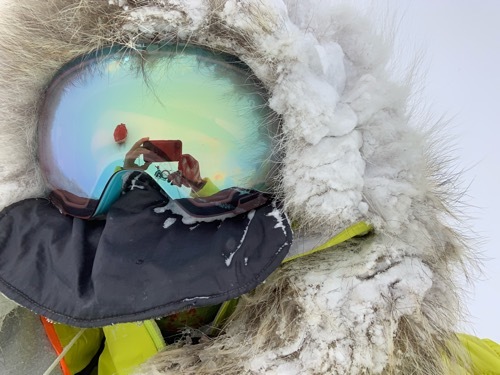 The next eight hours were some of the most grueling I've ever experienced on a polar expedition - and not for some epic reason unfortunately. The reality was, that after staring down at my compass bracket for nearly a week straight, my neck seized up on me - a troubling first for me. I tried to stretch but the only thing that even remotely worked was holding my arms above and behind my head. I struggled through in short 15 minute bursts still having to look down to navigate as it was still a complete whiteout (unbelievably to me). In my prior expeditions to Antarctica- or anywhere for that matter - the most consistent whiteout conditions usually last for part of a day. Usually just a couple of hours. Then, the weather blows through and things improve. Whatever vortex I'm in is sabotaging my efforts to reach the pole. The nice part about looking down so much was that I was able to watch my ski tips cut through the soft snow. It reminded me of being a kid and all the days I spent skiing and breaking trail because I loved to be out front in the fresh snow. Here fresh snow is just another thing impeding my progress unfortunately. The pain in my neck was so severe that I had to stop and set up camp a little over an hour early. Shoveling snow was a huge effort and once inside the tent, I couldn't sit up. I took 800 mg of ibuprofen and laid on my back for about 30 minutes and the pain subsided enough to allow me to set up the stove and start melting snow for dinner. Now I am laying down again, hot water bottle under my neck typing this blog. My spirits are high, but realistically, I'm not pleased with how this weather is affecting my ability to reach the pole. For now, there is nothing I can do and tomorrow is another day with hopefully better weather and better progress.